I've been starting the process of looking into and doing research on breeding, and getting a partner for my little boy. Unfortunately, as he was purchased from a pet store and not a breeder directly, I don't know much of anything about his lineage. I -did- contact the pet store to ask if he was from a sterile line, and the owner in turn contacted the breeder, who told her that his Father was a Lecustic, and his Mother was a Mosaic (white tail/white face. ), which I gather to mean - as they did not say otherwise, that he's from a producing line. Also, without knowing the full lineage of my boy, what would be the best option for his partner? While I love the color variations (especially the piebald/patchwork mosaics), I was considering getting him a standard grey, white faced blonde, or black beauty for a lady friend. Thanks so much for any suggestions you might be able to give! 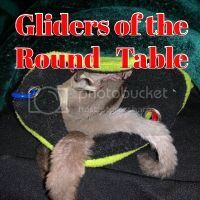 It has been standard in the glider community to strongly discourage pairing gliders without knowing their lineage for the purpose of breeding but rather having the male neutered. You mention the pet store contacted the breeder, so I would suggest asking for the breeder's name OR asking the pet store to have the breeder contact you for the purpose of getting the lineage IF the breeder has it. Without have the lineage of your glider, it is possible that getting another in your area, you might be getting a close relative. You have no idea how many this person has sold and to whom or her breeding practices. I was actually concerned with that- The chance of getting a Glider too closely related- so I had planned to buy my female from out-of-state, likely from one of the breeders on the Board here. I'll go ahead and give the Pet Store owner a call and see if I can get the breeder's information, or have mine passed along to them. We originally DID plan on neutering my boy, but he's just so beautiful that we really would like to see his line continue, and breeding Gliders has been something I've been interested in for many years now- I just hadn't had the option become available until now. I do hope that I can get a little more information on lineage, but my husband and I sort of jumped at the chance to get him the moment we first saw him. He's also got the most -fantastic- temperament, though he crabs, he has yet (knock on wood) to bite anyone at all, and has only 'lunged' once. From the day we got him he would allow himself to be petted in his pouch, and after having him for a week he's become used to being picked up- though he's still a tad wiggly and would rather run around my shoulders than stop for a cuddle. 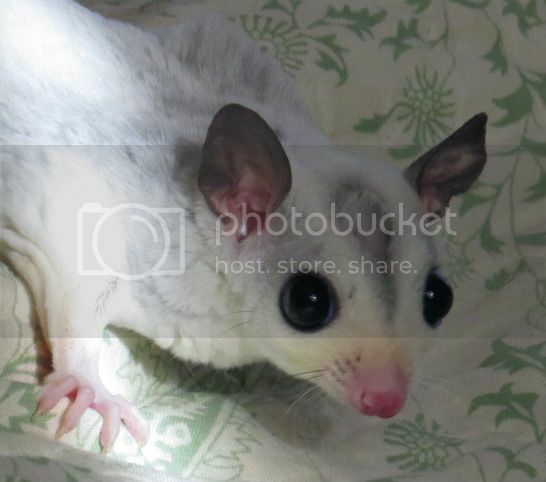 With his laid back personality and his coloration, I think he would make some beautiful joeys. Just a FYI, breeders ship gliders all over the United States (Legal States only). So your little man you have a full sister just two states away. It seems that the breeder sells the regular standard greys to a pet store and sells the more pricey Mosaics and Leus online. It seems like this particular pet store has several sources for Gliders, as well as breeding their own. I've left a message with the owner, so hopefully she'll get back to me and I can get in contact with the breeder. Honestly we were -very- surprised to find a Mosaic in a pet store, which is why we ended up buying him to begin with. We just didn't think that we'd find the opportunity again. IMO, this is not a good scenario and sounds more like someone who brokers gliders. Does the pet store owner, who also says they are a breeder, even keep track of lineage on their gliders? ETA: I know you really want to breed this little fella, and he is beautiful, however, without his lineage it would be my suggestion to have him neutered and just him. Last edited by KarenE; 12/13/16 03:25 PM. I honesty can't say if the pet store owner keeps track of the lineage of her Gliders- When we arrived there he was the only one they had left, so I wasn't really able to see what the typical environment was for the rest of their Gliders, because she'd sold out of the standard gray (which she sells for $300.) I was fairly surprised at that alone, as I've normally seen the standard color go for $150-$200, and our boy was sold for $500. I'm -hoping- that I can be put in contact with his actual breeder and get a little more information on his parentage and family history, because I would very much love to be able to breed him, but I also want to be cautious. If I can't get any further information, I may very well neuter him and just hope that I'll be able to get him a companion in the future regardless. You are correct. $300 for a standard gray is way high, especially these days when most people are only interested in colors. I would keep digging before you make any decisions. BTW, do you know how old he is. He has quite the pronounced scent gland. Last edited by KarenE; 12/13/16 07:10 PM. The price of Black Beauties has gone up to $300 or more. Everyone wants the black faced Black Beauties. He's supposed to have been 16 weeks OOP (now 18 I think) when I purchased him. At the time his scent gland still had fur all over it, but it was this oily and mud-colored stuff that was almost 'gunk' like in consistency. When I was petting his head the other day some of it finally fell off, and he happily let me gently scritch at the rest of it, so now he has a nice clean bald spot. I didn't get a call back from the pet store today, but I'm hoping I'll get one tomorrow. If I don't get a response this week, I'll just have to try again. So his little Bert Reynolds spot is clean now. I bet he is a handsome little man. If you hadn't had the chance to see him. ^^ I posted several other pictures in the Glider-Talk form. He is a handsome little guy! I just wanted to add my 2 cents on breeding him. Without lineage, it will be a tough sell as everyone seems to want proof of lineage. If you look up most breeders, they show two prices one price as pet only and one with lineage. if you wanted to breed him to increase your own colony/ family, just make sure to have him and any sons neutered ASAP. I've been thinking more along those lines if I can't get the information on his lineage, just having him breed once and then neutering him and any male offspring. As I mentioned I don't have extremely high aspirations for breeding (outside of making sure the Gliders are healthy, and well-socialized for their future homes)so I would only ever have up to three pairs.